California Risks Losing Their Entire Federal Share (nearly $4 Billion) of Education Funding | Public Advocate of the U.S.
"California's dangerous and willfully destructive confrontation with the federal government on the issue of immigration is well known and publicized. Public Advocate is exposing the lawless imbrace of illegal brainwashing and asking President Trump, in a Feb. 1 2018 letter, to punish California under existing federal laws that protect the rights of parents to opt out of brainwashing-- loss of federal funds, " says Eugene Delgaudio,president of Public Advocate. In general terms, there are a variety of sources with the federal government kicking in a small but substantial fraction of the total California education budget. Public school funding is the largest program in the state budget, receiving more than 40 percent of the state's General Fund resources. The 2014-15 state budget includes more than $45 billion in General Fund resources for kindergarten through grade twelve (K-12) education and child development. Overall spending for California public schools is about $76.6 billion when federal funds and other funding sources are added. "Programs run by the U.S. Department of Education, which distributes funding for numerous programs to all states, would be cut by $9 billion under the Trump administration's proposed federal budget for the fiscal year beginning in October. 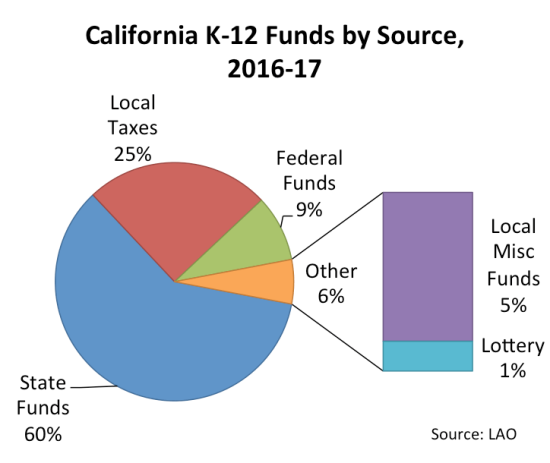 California's K-12 federal allocation would shrink from the 2016-17 level of approximately $4 billion to $3.64 billion in 2017-18." Public Advocate's February 1st, 2018 letter to the President asks all federal funds be ended to California. We are asking that the entire $3.64 billion in 2017-18 be held back and not sent to California unless and until parents are allowed to opt out of homosexual history brainwashing," says Eugene Delgaudio president of Public Advocate.